Don first dreamed of becoming an astronaut when he was only 5 years old and watched the first American launch into space on a small B&W television set up in his elementary school gymnasium. He knew this was his calling in life and that he too had to journey to space one day. Growing up in a lower-middle-class family in Cleveland, Ohio, he faced many challenges along the way. At the age of nine his parents divorced and Don was raised in a single-parent household by his mother. After graduating from college he began applying to NASA to become an astronaut. The first time he applied he was turned down. A few years later he applied again and was once again rejected. Not one to ever give up, Don began taking flying lessons, learned to sky dive, and taught a university course to enhance his background. Three years later he applied once again and was invited to the Johnson Space Center in Houston, Texas, to undergo a week-long series of medical exams and an interview, but in the end the result was the same as he was turned down. 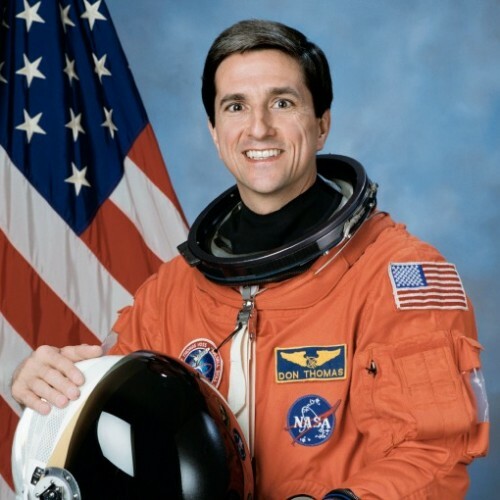 With a burning desire to reach space one day, he decided to move to Houston, Texas, and took a position as an engineer working on the Space Shuttle Program. A few years later he applied his forth time to be an astronaut. Once again he made it to the semi-final round where he again repeated the extensive medical exams and thorough interviews. Months later he received the phone call he had been waiting for his whole life when NASA informed him that he had been selected to be a Mission Specialist Astronaut. The journey didn't end there however. A few months into his training he was diagnosed with cancer. After surgery and radiation therapy, Don fought back and continued his pursuit to make it into space. Finally on July 8, 1994, his life-long dream was realized as he launched aboard Space Shuttle Columbia on his first of four trips to space. Don's story of persistence, hard work, dedication, and sacrifice, is both highly motivational and inspirational and a great recipe for success in life.